Are you in the market for a hearing aid? Choosing the right fit for you depends on a list of factors, including your level of hearing loss, your lifestyle, and budget. The process is challenging as your determine which hearing device will best suit your needs. When determining precisely what you need from a hearing instrument, it is useful to consider the following tips. You are not alone in your path to improving your hearing health! With any health concern or issue, it is important to bring in those closest to us to help our decision making process. If you’re new to hearing aids, bring a spouse, family member or close friend to help you through the process. According to retired audiologist Juliette Sterkens, “Two people hear and remember more.” This mitigates any issues of misinformation or forgetfulness. The type of hearing aid really depends on what type of lifestyle you live. Most hearing health specialists will inquire about your lifestyle and hearing needs. Are you more of an active person that enjoys the outdoors or more of a homebody? What are your expectations from the hearing device? Do you just want to be able to listen to your TV or do you hope to hear the lecture in your college course? Pinpointing your priorities helps the hearing health professional determine what type and technology of hearing device is best fit for your lifestyle. Just as you can “test drive” a car, you can also ask your hearing health professional for a demonstration of the hearing instrument you are interested in. It’s easy to put disposable plugs on the tip of a behind-the-ear hearing aid and adjust the instrument to your level of hearing loss, allowing you to experience how it works. This simulation allows you to see how certain hearing aids work in different settings. Technology has advanced within the hearing loss field. Directional microphones will be able to heighten your ability to hear in noisy places. Hearing loops and telecoils can improve hearing in certain environments as the network of microphones are amplified through electromagnetic waves picked up by telecoils in your hearing device. Frequency-modulated systems (FM Systems), like loop systems, can also improve hearing in certain settings, as the sounds are transmitted via radio signals. Infrared systems work in a similar way, moving sound through invisible light beams. Learning about these technologies will enhance the hearing experience for hearing aid users. 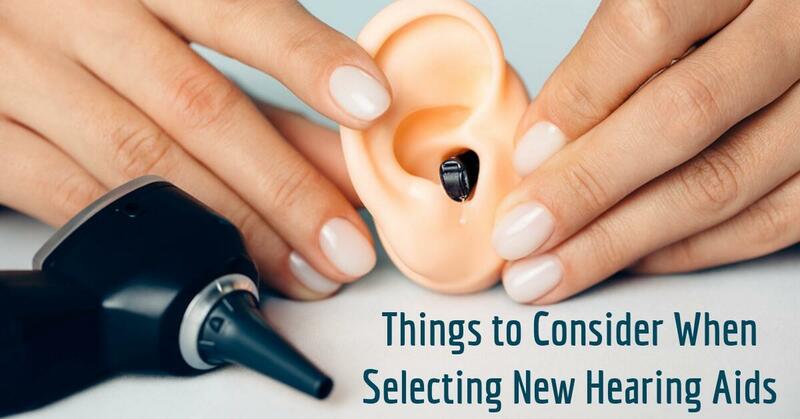 Choosing the right hearing aid and getting a good fit aren’t the only things you should be looking out for. According to audiologist Barry Freeman of Zpower, “You don’t hear with your ear, you hear with your brain, and your brain doesn’t know what to do with the sound after you get hearing aids.” Inquire with your audiologist about aural rehabilitation so you can train your brain to process the sounds from your hearing aid. It’s vitally important to double check the fit and effectiveness of your hearing device. Just as one would check both of these things when getting a new pair of eye glasses to improve our vision, we should do the same with our new hearing device. Does it fit well in your ear? Does it do what you want it to do? If you’re ready to select a new hearing aid, be sure to choose a hearing health professional that you trust. The value you get out of your hearing device depends on the abilities and skills of your provider. Both of our audiologists at Beverly Hills Hearing Center are members of the American Speech–Hearing Association, so you’ll know you’re getting quality care. Reach out to us at Beverly Hills Hearing Center to set up an appointment to get tested today! We will be able to provide you with a hearing test, analyze your level of hearing loss, and a help you choose the appropriate hearing device that fits your lifestyle and needs!